Mains batches are exclusively designed for practice of conventional questions for ESE-2019. Although the syllabus of ESE pre & mains is well covered in classroom course, still the interested candidates can enroll in these batches to develop the required skills to excel in Main examination. The approach followed in these batches is very beneficial to improve answer writing skills and special emphasis is given on presentation of answers. These batches are supplemented by well-designed ESE-2019 Mains Offline Test Series as per UPSC-QCAB pattern. These batches are offered only at Delhi Centre. Very useful to develop numerical solving approach & improving writing skills. Comprehensive and in-depth discussion on variety of conventional questions, thus strengthening fundamental concepts. Special focus on improving answer layout specially for theory questions. Classes will be delivered by senior faculties. Updated Mains workbook for every subject having varied practice question sets. Test series will be conducted on every Sunday in synchronisation with the subject taught in class. Take a printout of registration acknowledgement slip & submit it along with the fee at concerned MADE EASY office. Fee can be paid through Cash/DD/Debit or Credit Card at all the respective Centre. Self attested copy of Identity Proof (such as Passport/ Voter ID/ Driving License/ PAN Card etc.). MADE EASY ID-Card (if you are an Ex-MADE EASY student). Cheque payment is not accepted. Candidates who are willing to pay through DD are advised to register online before proceeding for DD preparation or call us on 011-45124612 to get DD details. Write your Full Name, Branch of Engineering and telephone number on the backside of the Demand Draft. Candidates, unable to reach the office in person, can take a printout of registration acknowledgment slip and send it along with the Demand Draft to the respective Centre. MADE EASY ID-Card (if you are Ex-MADE EASY student).. Candidates are advised to register online before proceeding for DD preparation or call us on 011-45124612 to get DD details. Admission in the registered batch is subject to availability of seats at the time we receive your DD at the respective office. Write your Full Name, Branch of Engineering and contact number on the backside of the Demand Draft. For our Classroom Programs, you may also apply through the Online Admission. Student needs to pay the full fees at the time of admission only or in installments after reading the Terms & Conditions of installment facility. After successful completion of registration, receipt will be generated. Click on the Print button or save button given at the end. For every batch, there are a limited number of seats available through online admissions. Once the batch and Centre is allotted, request for transfer of batch or Centre will not be permitted. Classroom entry & issue of material will be only after you procure your MADE EASY ID Card. Payment confirmation & ID card will be issued after 48 hours of registration. Corporate Office: 44 - A/1, Kalu Sarai, Near Hauz Khas Metro Station, New Delhi-110016 (for all Delhi & NCR Study Centres). For other Centres, kindly visit the admission desk of respective cities i.e. Bhubaneswar: Plot No.-1441, CRPF Square, Opposite of IOCL Petrol Pump, Bhubaneswar - 751015. Kolkata: 755, Anandapur, Next to Fortis Hospital, Off-EM Bypass, Kolkata - 700107. The campus of MADE EASY is safe and secured. The campus is under electronic/CCTV surveillance for safety and security of its students. The institute has well equipped audio-visual classrooms with state-of-the-art equipment and includes LCD projector, which helps in conducting interactive sessions and presentations. There is also in-campus facility of photocopy, books shop and canteen. A doubt left un-cleared builds up in many more doubts and confusions. 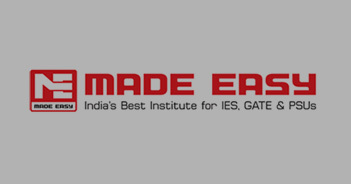 MADE EASY is the only institute which gives special emphasis on doubt clearing sessions. Student can take help of faculty members if he/she has major doubts in a particular subject and if there are minor doubts then help can be taken from Assistant faculty. The main aim of doubt clearing sessions is to provide an extra attention and a personal touch to the students, who are facing challenges in understanding some concepts. Doubt clearing sessions are conducted before or after the classes. The benefit of these sessions is that they encourage the students to clear their doubts on any topic/subject so that their actual performance is not affected. These sessions also act as a big motivator and help them to renew their energy and enthusiasm towards their goals. Apart from this, faculty members or panel provides round the year support to clear the doubts of the students. MADE EASY is also providing 24×7 Online Discussion platform namely Student's Portal Facebook++ which is basically a networking platform for technical discussions wherein students can post their doubts, attach images, comment on posted doubts and get reply of the queries from the experts. The phase of preparation for competitive exam is a tough phase for any aspirant. There are situations when peer pressure, exam pressure, college / work pressure makes every student weak; and this is the time when student looks for a career counselor and motivator. And which institute can be better than Made Easy when topic of guiding, mentoring and motivating comes up. Regular motivational sessions are conducted for students. Both personnel and group motivational sessions are taken by our experts. Our students are trained to produce results while maintaining focus and energy. To create awareness on different competitive examination among the students. To provide necessary information and guidance for the preparation of competitive examination. To orient the students for competitive examination. To ensure proper utilization of time spent outside the classroom by students. To motivate students for studying in groups to have better results. To help in the overall development of the student. To help in making proper choice of courses. To support the students in the development of soft skills and verbal ability to challenge the rigors of competitive tests. To inculcate social values and ability to think independently for carrying out social responsibilities.